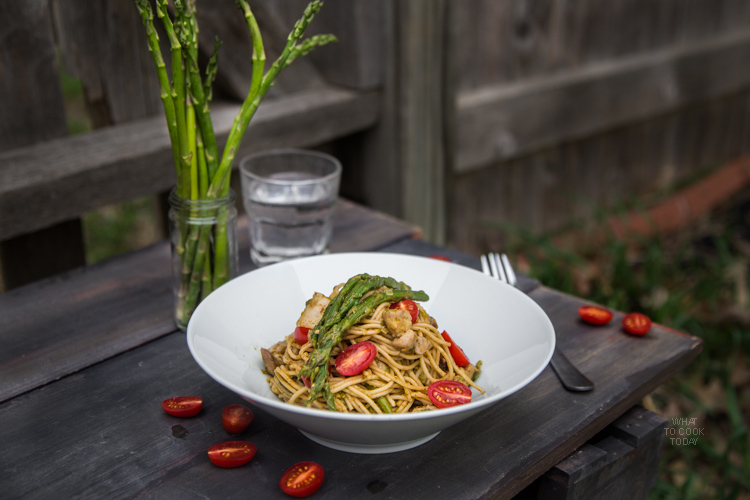 Spring spaghetti with chicken and pesto ala Genovese – Whole grain spaghetti with chicken and fresh spring vegetables like asparagus, leeks, and cherry tomatoes tossed in pesto ala Genovese. The snow is out of sight and the rain is pouring in now. YES, it’s officially Spring in Minnesota ! I feel like it’s kinda early for Minnesota’s standard, but hey…I’m not complaining! I would take rain over snow 🙂 Despite the rain, I love Spring. The grass is green everywhere, my perennials are showing up, and fresh colorful produce is abundant. It just makes my heart happy seeing all the colors. Another thing I really like about the warmer weather is that I can let the kids play at the backyard while I’m preparing lunch and dinner (and taking photos 🙂 ). When they come back in, they are usually starving and eager to eat. We have pretty active lifestyles. My husband and I hit the gym 4-5 times/week. 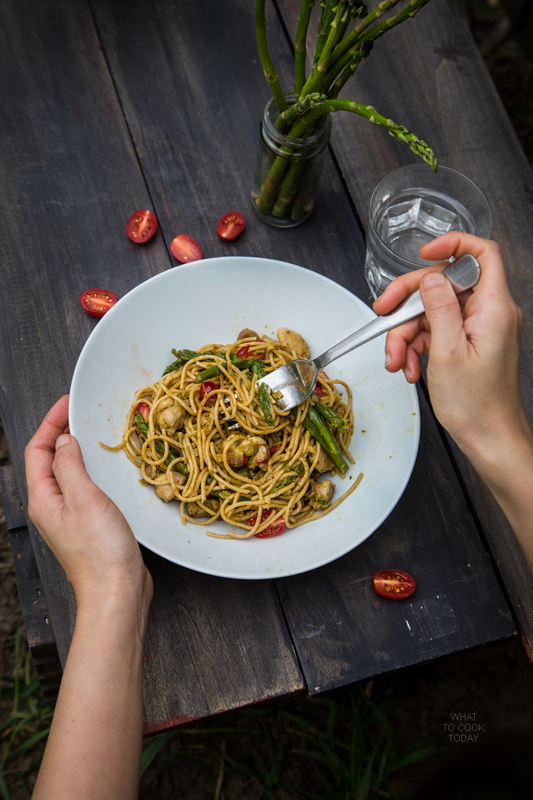 While we enjoy good food on the weekends, we are trying to keep things in balanced with lighter meals during the weekdays. 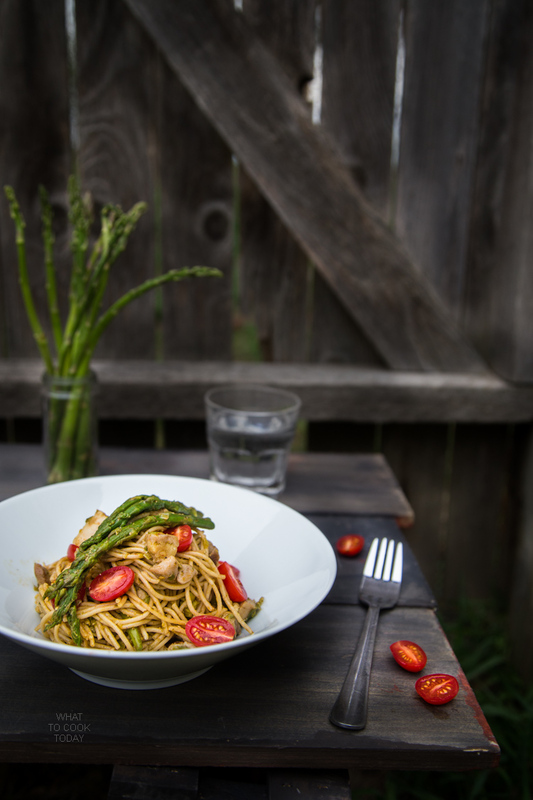 I cook a lot with fresh produce and trying to avoid processed food as much as we can. 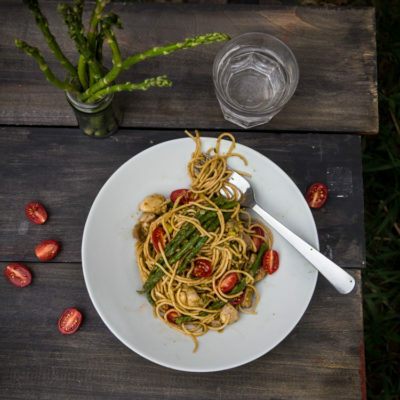 My kids know that we will have fresh vegetables for lunch and dinner every day and so my daughter often asks “What’s veggie you cooked today mom?” In a way, I’m happy because my effort of trying to cook wholesome delicious meal for my family, somehow pays off. Variety is another thing that I’m trying to include in my daily cooking. Mainly because I have kids and one of them is rather a picky eater (it’s getting better) and my philosophy when it comes to this is “Try it before you say you don’t like it”. The kids know this mantra by now. My daughter loves noodles and pasta of any kind. So, needless to say, these show up a lot in our menus. 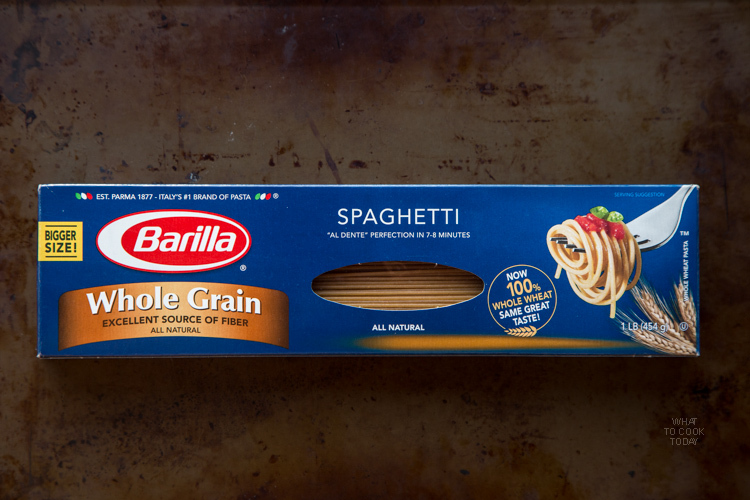 I’m beyond thrilled to find that Barilla whole grain pasta is made of 100% whole wheat. The kids love it too. 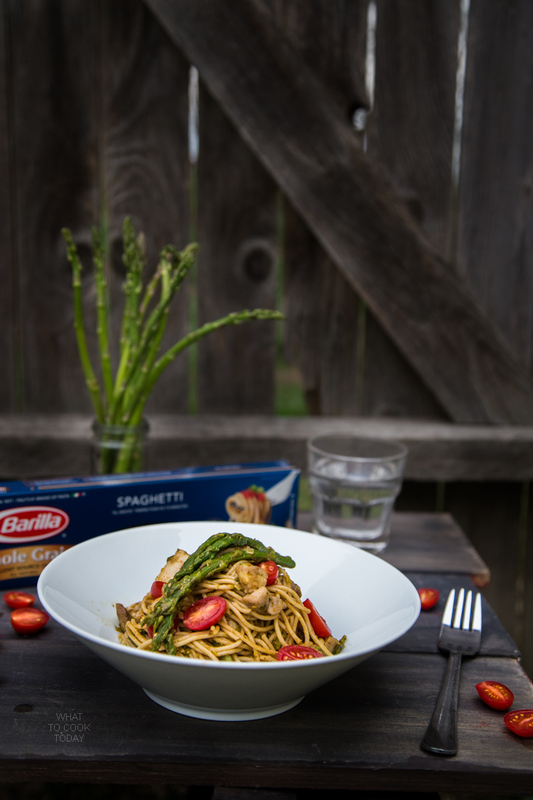 So, I’m pairing Barilla whole grain spaghetti with fresh produce like asparagus, leeks, cherry tomatoes and delicious pesto ala Genovese made from scratch with fresh basil. My mom cooks a lot with leeks and she likes to use them to stir fry Asian noodles. 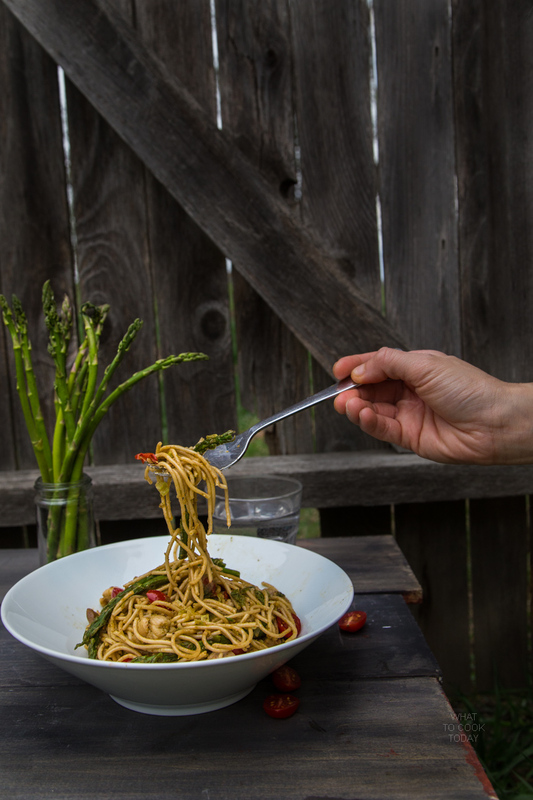 I don’t see leeks being used very often in pasta dishes and so I thought leeks would definitely give this spaghetti dish a nice flavor, and they did. 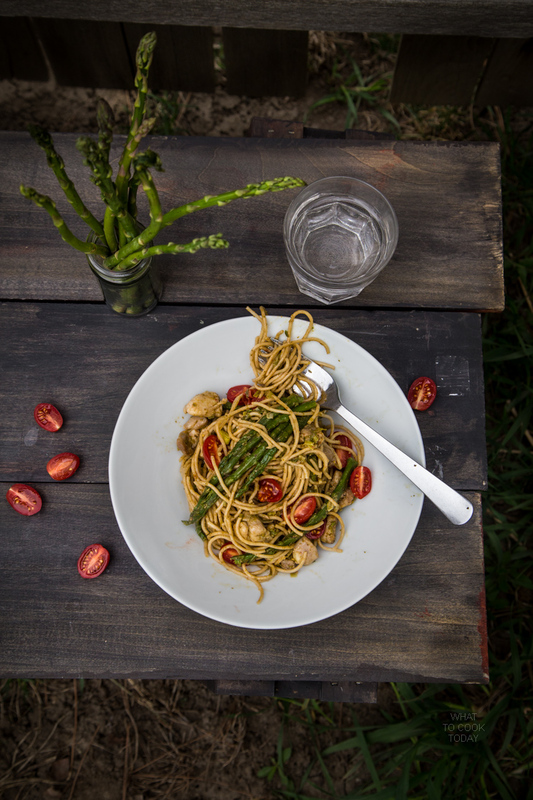 The flavor of the leeks and the pesto ala Genovese paired so well with the spaghetti, chicken and everything else in this dish. 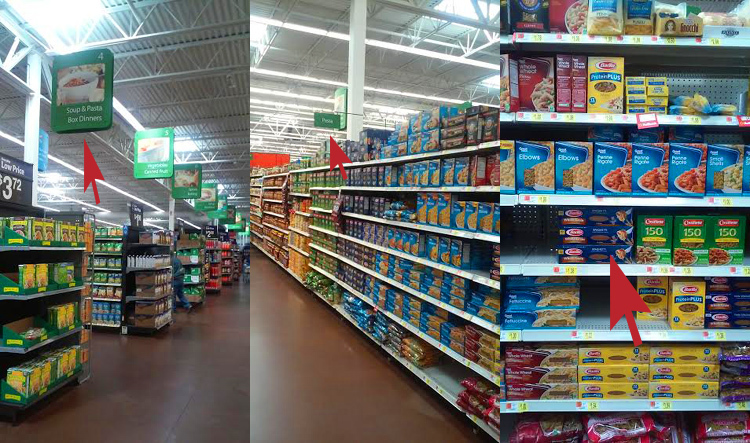 Check out Barilla Better for you Pasta at the pasta aisle at Walmart. You can buy any 3 select varieties and earn $1.00 with this offer too.